In this metaphor of the linn, our lives are likened to that of a river, which flows softly onward as it reflects the blue sky above. It gives no thought to the inevitable changes ahead, and without warning its meandering path becomes violently steep. Suddenly the once-peaceful river is bound to a narrow gorge, forced to rush between sharp, jutting rocks in a swirl of passion! The waters finally settle into a black pool, waiting for the sunlight to shine once again over the calming river. This compelling story follows the changing life of young Lettice as she makes her way through the linn. Love ultimately triumphs, bringing hope and brightness back to her youthful days. From Cindy P of Colorado Springs, Colorado on 6/25/2016 . Once again I have read a wonderful, terrible, convicting Lamplighter book. 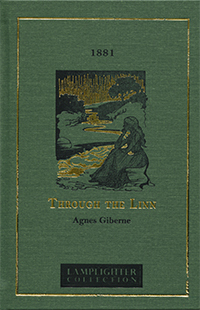 Through the Linn by Agnes Giberne was originally published in 1881. The story of a young woman suddenly orphaned and sent to live with distant relatives along with her younger sister was written to instruct and point to the reader to Christ. To which of the characters do I most relate? Is it the older cousin who takes in the orphans but is incapable of showing them true kindness because of her own shallow nature? Or to the stony heart orphan, Lattice, who has shut off her broken heart from communion with God and man? The book led me to examine myself and ask God to make me a more effective distributor of His love. From Paul Blaze of Huntington Beach, California on 2/7/2016 .